I wrote the following out of boredom a few months ago while I was training at 29 Palms, California and just forgot about it until now. It's disorganized rambling and random tidbits about 80% lower vendors and products. I don't think it holds any relevance anymore, but whatever. On a sidenote, I still haven't received my order from Polymer80. Why didn’t they plan this out? Did they test those before deciding to mass-produce them? Or did they just make something up in CAD and just assumed it would work? Why didn’t they show test videos from the first generation lowers that were scrapped? Did any of them ever work? Did they even do any testing before this video was released? In other news, there’s also a unique type of 80% lower from KT Ordnance that doesn’t seem to get much discussion on forums. He was one of the first manufacturers in the 80% AR lower scene and made the news when he was raided by the ATF (and by the Canadian authorities, for some strange reason), but I guess charges were dismissed. His operation looks legit and he has some cool stuff for sale, but he only accepts payment in magical gold doubloons (seriously), so screw him. That 80% “Franken-Stone” AR15 lower looks pretty sweet, though - just bolt it together and ream out the FCG pins. It’s too bad the guy is a tinfoil nutjob and his currency system is demented. Another thing, if you were to convert the pricetag in tinfoil tokens to Earth/America Bucks, that equates to $550! 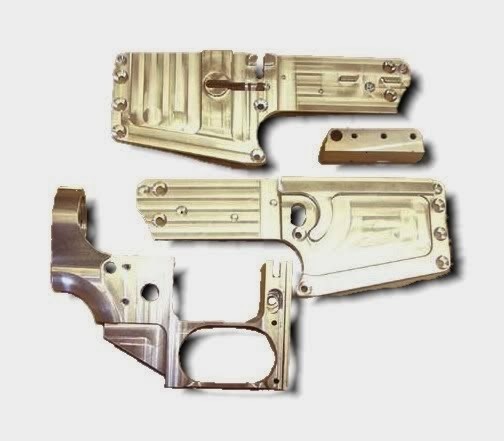 If you’re willing to invest in his leprechaun coins, the bolt-together AR lower looks to be the easiest of all to assemble. This has been out for a long while, but far as I know, nobody actually owns one of these yet. Or perhaps no one wants to admit it. Actually, here's one on calguns where someone bought one after the raid and it turns out now you need to mill out the FCG pocket. You could probably slice out the center piece with a hacksaw or a Dremel cutoff wheel. Either way, it's still more money than it's worth. …And did you ever notice that there have been several producers of AR15 80% lowers that have had a sneak preview of their lowers and made them available for pre-order? But then at the last minute, decided to suddenly make major, last-minute changes to the design of their lowers. One example of this is Polymer80, who just days before they were ready to ship their lowers, decided they needed to redesign the lower to add material around the takedown pins. So they delayed it by a month. Also recently, JamesMadison Tactical did this as well as PrecisionArms Manufacturing. It started out looking like a normal AR lower, then halfway through they decided it would get unrounded edges and a winter trigger guard, similar to JuggernautTactical’s. In Precision Arm’s case, it would seem this is all presumably to cut down on machining cost. But why would Polymer80 do that? It all seems very suspicious. “Hey, we just finally test fired our lower at the last minute and found out that it needs reinforced pivot pins!” Or in the recent case, to prevent warping. Or maybe they don’t want other company’s jigs to fit their lower, and changed the design so people would be forced to buy their jig. Or maybe they’re purposely delaying to get past the three month window for credit card owners to file chargebacks? End of Tinfoil hat rant.